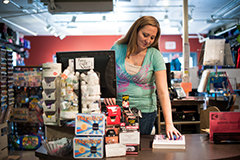 The Columbia Gorge Community College (CGCC) Bookstore is dedicated to serving the academic needs of the college and the community at large. Everyone is welcome here to shop or visit us, you don't need to be a student! We provide textbooks, supplies and supplemental items related to instruction. Additionally, we supply the college with necessary items (such as letterhead) and serve the greater community by offering a wide selection of art supplies, college apparel, backpacks, office supplies and more. CGCC Bookstore Facebook page. Regular Hours: Monday through Thursday: 10 am-6 pm. Need Books or Supplies but can't make it here during these hours? Call us at 541-506-6061 or email us at bookstore@cgcc.edu and we will set up a time that is convenient for you!